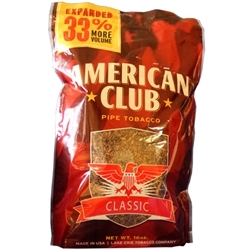 American Club Classic Pipe Tobacco, is a classic domestic blend of flue cured Virginia and Kentucky burley tobaccos with a strength offer just a shade beyond mild. Produced by Seneca Distributions, American Club Classic is shag cut that packs nicely into your favorite smoking pipe, stays lit easily yielding a slow burn rate. Blended premium Virginia and rich Kentucky Burley’s with a touch of mint flavor are the key components that make up American Club Menthol Pipe Tobacco. Light, mellow, and flavorful are how smokers describe this unique domestic brand. Pick up a 6 or 16oz pouch from Smokers Discounts and begin your delightful smoking experience today!